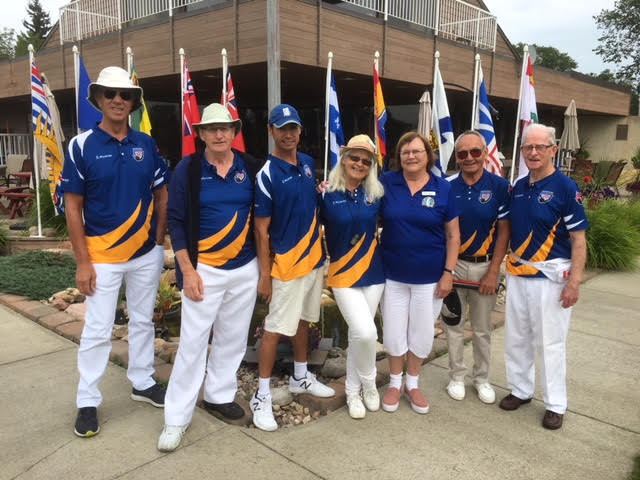 It was a great couple days for British Columbia Blind Bowlers as they headed off to Edmonton, Alberta to play in the Canadian National Championships that was held recently from August 28-Sept 1, 2018. The tournament ended with one round of games to finish off the section play for the B 2-4 and a game for Bronze / Silver in the B 1’s. I am not sure why the gold / silver game did not take place other than Randy had won all 4 of his games by such large margins. We would have preferred to play another game. He did win the Gold medal and also received the plaque for the top B 1 in the competition. In the mixed sight categories Terry Baker was awarded Bronze in the 3rd section and Jay Gatley won Silver in the 2nd group. Lisa Bonnie of Kelowna placed 3rd in the top section after the 3 bowlers each had a win and a loss. Special thanks to Adrian Hewitt and Lorrie Kobitz for travelling with and directing our Bowlers. The tournament would be finished off with some delicious food at the closing banquet, along with some great entertainment provided by bowlers Randy Fred and Jay Gatley. This was a great way to end a fantastic event. From left to right Terry Baker, Adrian Hewitt, Jay Gatley, Lorrie Kobitz, Lisa Bonnie, Randy Fred, Donn Sherry.